Is your little one a Picasso in the making? Celebrate their love for art this Halloween with a DIY project that requires just one yard of fabric! 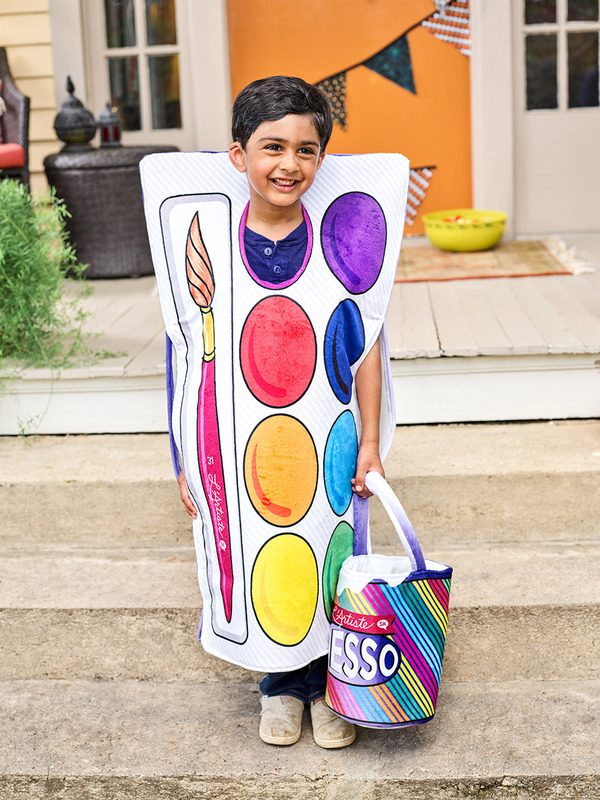 The only scary thing about this costume is how little space you’ll have left on your phone when you’re done capturing your budding artist in this soft Minky look. Follow along as Samarra Khaja, aka sammyk in the Marketplace, shows you how to recreate this one-yard wonder. 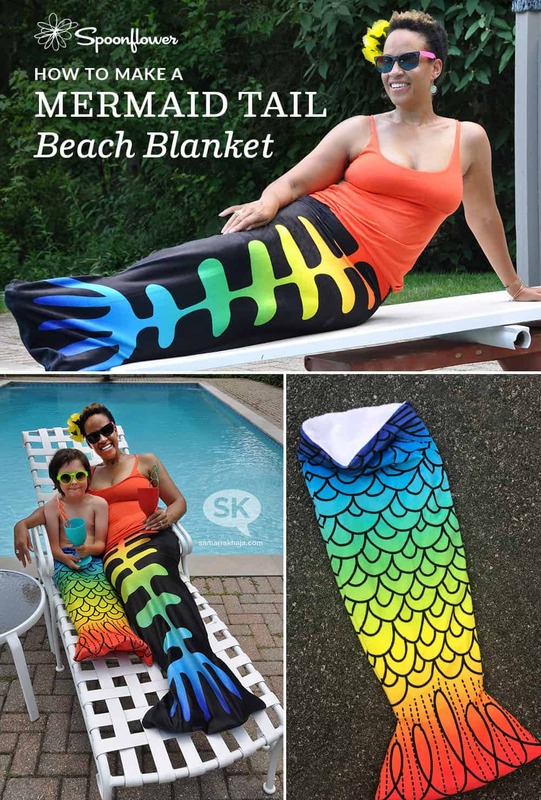 Those of you who have followed the Spoonflower fabric-of-the-week contests for even a few months probably don't need an introduction to prolific designer Samarra Khaja, aka Sammyk. Samarra has a light-hearted design style coupled with a great sense of both humor and color, and she's won our contests multiple times. She's also gone pro recently, with two new fabric collections debuting with Timeless Treasures (and more in the works). Samarra graciously agreed to answer some questions about her new collections during this busy Thanksgiving week. Read on for more about her new work and a chance at a giveaway! You’ve won Spoonflower’s fabric-of-the-week contests so many times at this point that I’ve lost count of your wins! Do you feel like you work better when given a specific theme and deadline, or do you prefer to be more spontaneous in your designing? Yes, the contests are clearly an addiction. Although you wouldn't know it, I do have an ongoing to-do list of random designs I want to create and they almost always get trumped by the weekly challenges and that darned bee in my bonnet to try my hand at an entry. I really do love being given assignments. I thrive on it. Add to that a hard deadline and I'm really in my element, painting myself into a corner to see what I come up with in a limited period of time. It's the MacGyver-esque cobbling together of seemingly disparate ideas into something convincingly cohesive that I really love. The crazier my concoction the better. That's why I had to make a roller derby toile. It made no sense in a perfect enough way that I simply HAD to create it. Your dad is an architect and your mom is a painter. Do you ever see their influences on your style and aesthetic? What else influences your design work? I grew up around clean lines, modern and bold visuals, and I think a lot of that comes out in my work. I'm a big fan of interesting handwriting and clean penmanship, too. My having traveled and lived all around the world is a huge influence, combining bits and pieces of different things into (hopefully) interesting visual mash-ups. Most recently, coupling that perspective with seeing the world through my children makes for an even more interesting mix. I like to make things I haven't seen put together before. I like playing with scale, layers, styles and genres and coming up with something that has a whimsical, irreverent and happy feel to it. I love visual surprises and discoveries! Where did you get the ideas for your two new collections, Imagine That being released in Spring 2011 and Alphabet due out next month? I’m especially curious about the story behind Alphabet, which features hands signing American Sign Language letters. Alphabet was inspired by a pattern I created pairing grid-based LED letters along with their Braille equivalents. That exploration of the ways we communicate branched into wanting to illustrate the alphabet through American Sign Language letters. Having a brother with Downs Syndrome and being of mixed heritage, I'm very aware that the world is made up of oh-so-many different types of people with different characteristics that define them. So I was thrilled to design a fabric that celebrates an amazing form of communication that is often overlooked. How is designing fabric different now that you’re not just on Spoonflower and have gone pro? I have to pay more attention to my colors. I'm clearly a color glutton and when given half a chance, I'll pick five barely discernibly different reds, just because I can. It's when you find yourself having to whittle 83 colors down to 18 that you realize you probably should have controlled yourself in the first place. How do you think Spoonflower will continue to fit into your fabric design life? I think Spoonflower will continue to be a big part of designing for me, as it really gave me the platform to be the textile designer I am now. Not only that, but I'm now part of an amazing community of designers that I can talk shop with, which is invaluable to me. Even if I do slow down with my contest entries, the themes themselves will continue to spark ideas and help generate thinking down avenues I'd not necessarily travel otherwise. That's something I simply love as it keeps my creativity and ideas fresh and challenged. Did you sew before you started designing fabric? Do you try to have an end use in mind when you’re working up fabric designs? Yes, I did. My mom taught me how to use her machine when I was young, and my hand-sewing is also pretty swanky if I'm not in a hurry. (My ladder stitch is quite impressively invisible.) I made a twin-sized machine quilt for myself when I was 11. I was very proud of myself for that project! My parents still have it at their home. I look forward to passing along my skills to my sons. My 3-year old has requested an orange sewing machine (his favorite color), so I'll have to see if I can come up with something suitable for him once he gets a little older. Do you have any other fabric design collections in the works at the moment? And if so, when can we expect to hear more about them? Oh, yes! I'm firing from all cylinders at the moment and there are a number of collections in the works. Spring 2012 will debut some more; some that might look familiar to SF aficionados and some other new ones. I can't wait to share them! Thanks, Samarra! Thanks also to the folks at Timeless Treasures who have kindly sent us a bundle of half-yard cuts from both of Samarra's new collections. If you'd like a chance to win this bundle plus six fat quarters of some of Samarra's Spoonflower designs–five of which are being released for sale for only two weeks!–please comment on this post. Entries close next Tuesday, 11/29 at 7:00 pm EST, and we'll announce the winner on Wednesday, 11/30. Good luck–and happy Thanksgiving to all our US customers! ENTRIES FOR THIS GIVEAWAY ARE NOW CLOSED, AND WE'LL ANNOUNCE A WINNER LATER TODAY ON THE BLOG.